Diet Struggles…Is It Over Yet?! I was hoping I wouldn’t have a post like this, but reality has sunken in: dieting is not easy. It is especially not easy when you go home to your family and they want to feed you. To start from the beginning, I’ve started seeing a dietitian. I actually only had 2 sessions with her thus far, and since August 1, I’ve been following a very specific diet plan in order to drop a few pounds. I think for the first week, I was really aggressive about sticking to my diet, making sure I eat plenty of fruits and vegetables. I was probably unbearable to be around, but we had plenty of healthy food stocked and I was getting in a good groove. But then things started to take a turn…August has been a very social month. My boyfriend passed his CFA exam so we celebrated with drinks. I went to NYC and had to make “smart” choices at restaurants. Then I went to my hometown for a weekend full of baby back ribs, baked beans, potato salad and bacon cheeseburgers…not to mention a little bit of pizza and wings. And this weekend was my birthday, so…shots anyone? I was really excited that this “diet experiment” would be winding down. I was scheduled to meet with Danielle this Wednesday. But guess what, my boss scheduled a meeting that conflicts, so now I have to wait a whole extra week before I weigh in and see where I stand. I haven’t fallen off the wagon yet though. While I feel super guilty when I eat “bad” food, I still think I’m doing a decent job. I’m really ready for this to be over! How do you cope with a diet? How do you keep yourself motivated? I’d love to hear suggestions! There’s no place like home, as the old saying goes. This past weekend I was back in my hometown of Buffalo, New York for a high school band reunion. My boyfriend was kind enough to come along for the ride. I was able to show him around town and give him a taste of the place where I spent almost 18 years of my life. I got all warm and fuzzy when I showed him my old high school, and the park next door where we used to run around at track practice. 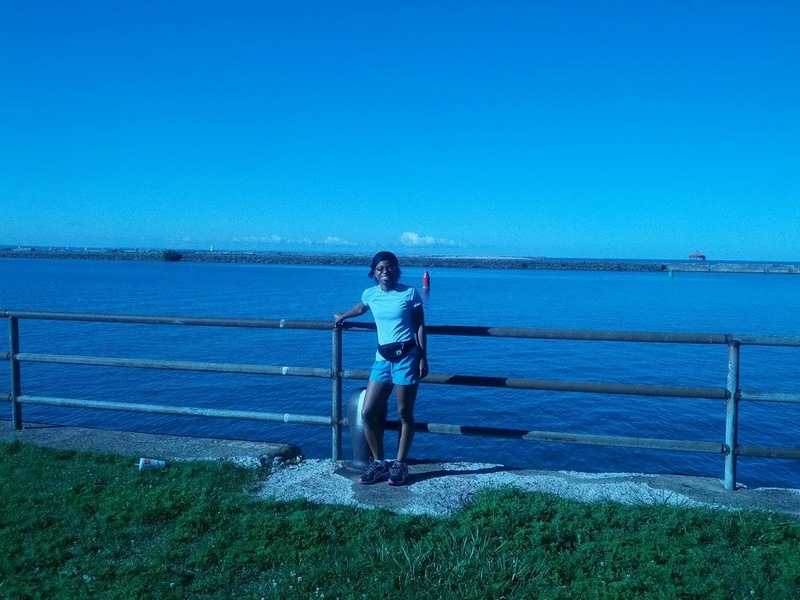 On Sunday we went for a run down to the waterfront. I have so many memories of going there as a kid, mostly on school field trips. My mom gave us directions to get there and within 15 minutes, there it was! Down by the marina…nothing here has changed! As we ran for about a mile or so, I decided we should just walk. My GPS was acting up and I was getting frustrated. But the walk was so calming as we were able to just unwind a bit. It was so quiet out there! Buffalo is nothing like Philly on an Sunday morning. It was so refreshing. I’ve been practicing improving my form. My boyfriend says I swing my arms too much when I run, which may be causing some of my issues. So now I’ve been consciously keeping my arms closer to my sides. Uncomfortable, but necessary. Most of the time, I’m WAY too hard on myself when it comes to running. The reason I named this blog “Run With No Regrets” is because it is a philosophy that I strive to follow. I’ve had a lot of challenges along the way with running, and as I struggle, I have to remember how far I’ve come. Things aren’t perfect right now…not even close. My knees still pop all the time, my new shoes may be too much of a change for my feet (constant arch pain), and it feels like it takes more and more effort each time I go to run. But I can’t have any regrets, and I won’t give up. I love to run, and I want that love to manifest…so as advised by my bf, I will take more time to run gadget-free: no watches, no Runkeeper. Use the time to reflect, to escape, not to hit a quota for the week. Attitude is everything, and hard work always pays off. It is worth it. No regrets! It’s my day off and I am sooo happy about it. This week has been super hectic, not just at work but at home as well with doing so many errands almost every day. While I have great work schedule, I truly relish my days off and try to make the most of them, even if I do nothing at all. Two weeks ago on my day off I went to barre class, which was my first attempt in several months since the stress fracture. While I had some challenges, it went really well. This time, I decided to go to 9:30 am yoga. Before anyone gets any wrong ideas, I must confess that I am a yoga newbie in every sense of the word. I only really know the poses that most fitness classes save for the end of the workout (downward dog, child’s pose and the like). I wanted to take yoga to increase strength and flexibility and to reduce stress! I bought a Livingsocial for Raja Yoga that had 10 visits for $25. An absolute steal! The first time I went it was scorching hot and completely packed. This was hatha yoga, not bikram! It’s not a big place either…but it was really relaxing and I was surprised that I was able to do most of the moves. This time, which is actually my 2nd time, the vibe was really different. The regular instructor/owner wasn’t there, and only four of us wanted to get our yoga on. I was nervous since the last time I went was maybe back in May or June, and it was much harder for me to keep my mind “present”. I kept thinking about my weekend plans or about how loud the man next to me was breathing. But things improved as I went along and John was able to tweak me here and there to get into the poses. I really enjoyed myself and I always notice myself much calmer when I leave than when I come into the studio. I do feel a bit of pain in my left knee probably from that pigeon pose…but I feel great! What kind of workouts do you do on your day off? Or do you use it as a rest day? I’m actually thinking about running or doing some kind of cardio later tonight…I haven’t run since Monday and I’m getting a little anxious. So, I’m home, munching on blueberries, enjoying the fact that I’m home “early” instead of running around doing random errands. 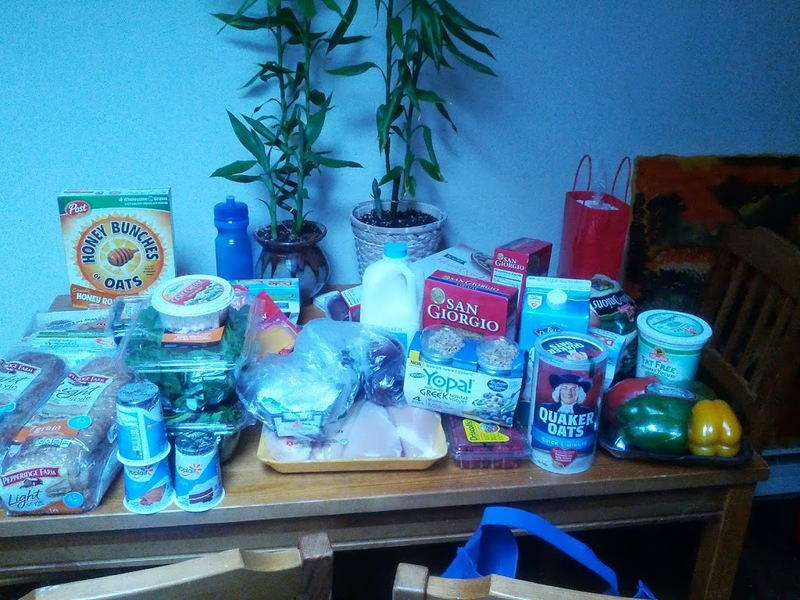 On Monday, I had quite the food shopping experience. We were running VERY low on groceries so I took the opportunity to apply all of my knowledge about nutrition to buy some really healthy food! Regardless of the craziness, I always get “in the zone” at the supermarket. It is something I truly enjoy…always have and don’t know why! For the most part I wanted to buy lean meats, healthy snacks, leafy veggies, fruits, yogurt and the like. Whenever I shop, I ALWAYS make a list, using the weekly sales as a jumpoff point, then buying the staples that are never on sale (i.e. milk). I’ve never been one to shop for food on impulse (though I can hardly resist Lay’s Garden Tomato and Basil chips….) so I wasn’t worried about cheating! There are a few things I bought, which you can see below, that I’m really excited about. I got a LOT of cheese: Muenster, Sharp Cheddar, Gorgonzola, and my favorite…Goat Cheese! I want to add the goat cheese crumbles into a nice salad along with the peppers, onions and spinach that I bought…with a LIGHT dressing of course. I’m also excited about buying the healthy wheat bread that’s 45 calories a slice, finally trying out Greek yogurt, and buying real, non-instant oatmeal. I tried it this morning with almond milk(!) but it was incredibly bland….so I’ll have to figure something out. My groceries. I think I did a good job! While I’ve been on this diet, I do wonder if it’s working…I haven’t weighed myself yet and don’t plan to. I want that “The Biggest Loser” moment when I step on the scale after 3 weeks and see what happens. Maybe that’s foolish, but I don’t want to obsess about this any more than I already am. I think I need to work on eating bigger breakfasts to avoid being so hungry in the morning. I do cringe at the thought of Danielle reviewing my food journal and shaking her head at my no-nos….sigh!